Are you appearing for Graduate Aptitude Test for Engineers (GATE) exam in 2019? Are you practicing daily or not? If you are serious about clearing GATE 2019, it is important to check if you are moving in the right direction. Have you heard of the phrase “Practice makes a man perfect”. It is 100% true in case of GATE. If you practice more, you will commit fewer mistakes. But the main thing to consider is to practice in the right manner. Now, let’s see how you can practice in the right way. Yes, it can be done through mock tests. Mock tests are nothing but practice test with the same pattern of real test but taken before the real exam. GATE mock exam is very important for your preparation to clear all the competitive exams. It shows your level of knowledge and tells you how much time you need to complete the test and the strategy to plan and overcome the weak area. You can choose for online mock tests as it is useful to tailor your brain and body before you attend the actual test. As the confidence and time management are inevitable to clear GATE exam, mock tests are the best way to attain it. Do you get exam fear, nervousness? Don’t worry, if you take mock tests, you will better come to know your weak and strong areas. Also, you can develop a strong positive attitude towards exam. Even though mock tests are important part, there should be a competitive analysis by the aspirants and should be conducted through a strict supervision. You will get 4 GATE mock exams per month that starts 4 months before the actual test and weekly two tests for the last month. The results will be published just like the real test. By seeing the results students can start preparing seriously and slowly increase the rank with each mock tests. Weaker sections can be found out and start working on it accordingly. Always stay focused on your goal when you prepare for any competitive exams. It is for sure that preparing continuously in a focused manner will show the good results. There are many evidences for that too. Competitive mind is good, but you shouldn’t get stressed. Enjoy your learning and problem solving techniques as well. When you get so many back logs while in engineering college, it will be quite difficult to score nicely in GATE. GATE is not only an eligibility test but also a test to check their problem solving analytical skills. If the test scores are low, there are chances to get a rank that is disqualified. Let’s know the benefits of attending mock exam after getting a right GATE coaching Calicut. One of the main factors of failure in competitive exams is the lack of confidence and unfamiliarity with the exam atmosphere. Since mock tests are created to simulate actual test, candidates will be used to it very soon. With 180 minutes of answering the questions once in a week is quite enough to boost the confidence level of aspirants. Through mock tests students get a chance to revise the syllabus for more than 10 times before the real test. Thus, it serves to be the best part in preparing for the GATE exam 2019. Don’t miss GATE mock exam and take it seriously just like your final exam. Fine! So, you got better confidence. Right? But, how about learning and memorizing the whole syllabus? It is said that exam oriented preparation will help you to retain the information quite a long time. Yes, mock tests pave way for a spaced out learning process and thus it helps in memorizing all important lessons. Mocks tests are a better than simply studying to memorize effectively. Which subject you like the most? May be mathematics due to problem solving skills, right? But for the GATE preparation, concentrating your favorite subject won’t work. You must balance between your favorite and not-so favorite subjects. It will be difficult if you don’t do so. Mock tests reveal your exact strengths and weaknesses and also tell you which part must be concentrated more next time. Thus it is advisable to attend mock tests in a very competitive manner after attending GATE coaching Calicut. Do you use virtual calculator on every day basis? If no, you must attend mock tests for GATE 2019. Virtual calculators are very difficult to use especially during competitive exams. So if you are getting used to it before your real exam, it saves lot of time. Online mock tests help to get used with many tools and these tools are really the trigger before you go to a real war. So, as of now, you are well aware of the benefits of taking mock tests. But, have you prepared for taking mock tests. Here are some tips to prepare the mock tests as well as GATE 2019. Don’t have two types of learning and planning for mock tests and real test. This is because; only if you focus well in mock tests you can excel in the real tests. Let’s see how to prepare for your GATE 2019 exam. You may have a clear idea about the preparation. You might have planned a rigid timetable or have clear experience from the previous GATE exams. 2019 GATE exam will be conducted by IIT Madras on 2019 February 2, 3, 9, 10. Exam will be for 24 papers including the newly introduced paper Statistics (ST). The syllabus is same as your undergraduate course, but is very vast. In order to qualify in the exam, there should be a good strategy to qualify the exam. Before the starting to prepare, check the eligibility to appear for the test. If you feel you are eligible, apply for it. The main thing you need to appear for the test is self-confidence and it will be achieved only through right preparation. Never forget to dream as dreams take you to the place you want to be some day if you really work hard for it. Consider every day is important and try not to waste any single day after you have started preparation. Preparing for any competitive exam without knowing the syllabus thoroughly is a waste of time. Aspirants can refer to GATE 2019 syllabus by visiting IIT Madras website in order to start the timely preparation. It can be applicable for GATE mock exam too. The detailed syllabus will be given for 24 papers separately which makes it easier for the applicants to categorize and prepare into easy, difficult topics. Next important factor to prepare for both GATE mock exam and the real test is to know the exam pattern. Without knowing the exam pattern the preparation will be in vain. There will be a combination of 1 and 2 marks 65 questions in the form of numerical problems and multiple choice questions. A total marks of 100 is quite difficult to complete within speculated time. Also, for GATE exam the mandatory sections differ, so you must know in prior what you are up against before starting the preparation. Questions must be read carefully and should be answered applying the formulas. There is no negative marking for these types of questions. A question with 4 or 5 options will be given and the aspirants are expected to choose the correct answer carefully. These types of questions have negative marking. Approaching a right GATE coaching center in Calicut helps to prepare a good timetable and practice tests from previous year question papers in order to gain experience in competitive examinations. If you are thorough with the syllabus before mock exam itself you will not find any difficulty in preparing for the real exam. While you are preparing for the mock exam or the real one you must try to cover the entire syllabus. Also, while dealing with each lesson or section, try to know the weight-age of the section, topics covering and make sure you do small exercises with each section. After preparing each section or lesson, try to solve past three year question papers covering those sections. Never go for easy questions always by checking online. Try to solve difficult ones and never leave any question unsolved. If you have any doubts, approach GATE coaching Calicut to find the better solutions with tips and tricks. By solving previous year questions papers you will get a good picture on which section to be concentrated more. Even though it takes some time, it is quite beneficial in all ways. If you plan well, you can bring colors to your future life. So never fail to plan for GATE 2019. It is imperative to have an important plan set up just if you are the sort of individual who stick to timetables and such. Else it regards simply have an expansive understanding of how to get ready for GATE 2019 and to accept the flow for what they are. How to plan for your mock exam and GATE 2019? Check the previous year papers. Divide the Topics into strong, weak and to be studied appropriately. Maintain daily/weekly/monthly targets to complete the preparation. Ensure that you to stick to them at any cost. Next make planning to such an extent that you reconsider the simple ones alongside the tough ones and the “never read” ones. This will guarantee you have an unmistakable perspective of what is to be concentrated and how you will do it. While many prompt checking the weightage and concentrate as needs be, it is truly not the right approach. Check the weightage by all methods and comprehend the important sections but never leave any unimportant sections. Make short notes while you study as this is will be useful while you are revising before exam. Write down important formulas that you cant remember so they are helpful for revision. Try to revise the formula on daily basis just before you go to bed. Begin rehearsing with test papers when you finished with a section or lesson. Don’t try to start the test papers after completing a whole chapter. You can start even before that. If you find any problem difficult to solve, keep a track of such problems for a quick revision. If you are doing your undergraduate now, try to relate to your semester topics, so that it will be easier for the preparation. Always try to cover the problems at the back of your text book, check the lecture notes as well. Sometimes, you miss to answer correctly the easy ones by concentrating only on difficult problems. When you begin by solving previous years papers, you may get low marks. Try not to get demotivated. It is only a sign that where do you stand. Check the areas where you haven’t scored well. You do have far to go before you can stay relaxed. Don’t complete one subject or some explicit points and then neglect them. That way, you will forget what you studied. Rather, revise them each 15 days. It won’t take much yet will keep you updated. Don’t aimlessly continue solving the previous papers. Try to check your problem solving capacity. No one can really tell how the questions will be. So it is imperative you see how to comprehend them instead of simply solving it or choosing the answer randomly. Don’t approach everybody to plan for GATE 2019 after getting right coaching. Define your very own planning as you probably are aware what works for you. While getting ready for GATE, it is vital to check for the books to refer. One option for you is to refer to your text books yet most toppers recommend that these books are extremely comprehensive with respect to the topic. Along these lines it is important to initially check the book list before beginning the planning. Try to refer same books for mock exams also. We have mentioned already don’t make huge difference between mock and real exam. Don’t think you can study some portions for the actual test. Try to clear it before mock exams itself. Here are the best GATE preparation books for 2019. Most toppers have approached with blogs and reviews to share their experience while preparing for the GATE exam. Check all those tips and see if it works for you too. NPTEL is one prescribed source to check. In any case, you should realize that it is controlled by IITs and for a superior part contains lectures as videos. These can help enormously to comprehend the subjects available. Best of all, it is free so you can check up the videos, instructional exercises and more. There are Facebook groups for each GATE paper. Go along with one and ask your questions, share the difficult questions and always be active in that group to know better tips and tricks for the exam. While preparing, never try to mug up any portion of lesson. But focus on the real concept. Otherwise you are not going to remember it for a single day too. Strengthen your problem solving skills in the meantime. While the virtual calculator is a compulsory for the GATE, try using it while solving problems during preparation time itself. This helps in mock exams and real exams too. If you use virtual calculator for the exam first, you will really have a bad experience even if you know the solutions well. The theoretical understanding will stand you in great stead when you don’t know an answer but rather can make choose the right one depending on your understanding of the points. Strengthening your calculation abilities will hold you in great stead in the real test when speed is the main factor of success. How to deal with your doubts? It will be normal to have questions while you are getting ready for GATE. 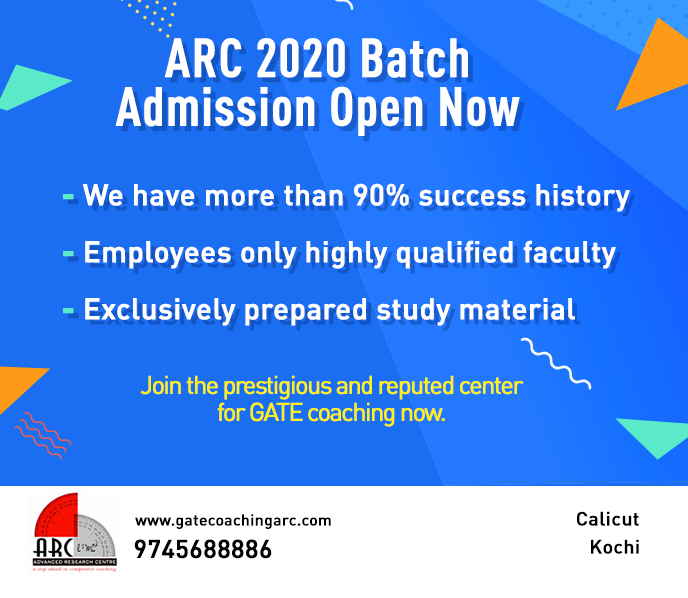 Approach GATE Coaching Center in Calicut, ask your seniors or join Facebook groups relating to GATE test in your picked paper and ask there – you will find the solutions. It is simply a question of contacting the perfect individuals. If you have joined GATE Coaching Center in Calicut, the questions will be solved there. With the assistance of online platforms, communicating with individuals is simple and helpful too. Each second is important while preparing for any competitive exam. This must be a basic part of your preparation on the best way to get ready for GATE 2019. Divide the months left into periods like planning, first revision, second revision, etc. Plan with the end goal that you finish the main phase of learning by October end. If you finish it by October, you can face mock tests easily with full of confidence. Begin with serious learning and revision from November onward. Don’t worry even if you forgot something you have studied earlier. Make sure this time you do well. Simply follow your timetable and work towards accomplishing it. Also check the do’s and don’ts of self-studying for GATE 2019. Some brilliant guidelines well laid by toppers and specialists manage factors that have nothing to do with the subject. Yes, even though subjects play important role in qualifying the exam, the right planning and following the time table is what you need to get through GATE 2019. Here are some GATE exam preparation tips. Never forget about your objective. You may have a stressful day still attempt and recover the following day to get back on track. Keep yourself energized enough for a successful journey. Try not to compare yourself as well as other people. Revision is vital yet examination is significantly more important. You should know where you stand as far as you’re planning at each phase, and then you can improve those weak areas. Take great care of yourself. Eat appropriately, have enough rest and don’t get stressed. If you feel stressed, take rest for 10 minutes or have a bath. In a nutshell, try implementing these tips in preparing the mock tests and GATE 2019. It is for sure you will get qualified with a great score.